January 2015: On January 14, 2015 Congresswoman Eddie Bernice Johnson (D-TX) and Congressman Peter King (R-NY) reintroduced the National Nurse Act of 2015 in the 114th Congress. According to Congresswoman Johnson's press release the National Nurse Act works to move preventative health forward by designating the acting Chief Nurse Officer as the National Nurse for Public Health. This position would provide a publicly visible nurse leader who would function alongside the Surgeon General and collaborate with health care leaders to address health disparities, set goals to improve the health of Americans, and raise the profile of the entire U.S. Public Health Service. Highlight impact of chronic disease, health disparities and health illiteracy within U.S. Discuss reports calling for increased efforts for health promotion and prevention. Explain the tenants of H.R. 379. Describe rationale for a National Nurse for Public Health. Review changes in current bill language. Request support and answer questions. NNNO President Teri Mills MS, RN, CNE and NNNO Director Elizabeth McPhee RN reviewed the overwhelming evidence demonstrating the critical need to boost health promotion and prevention efforts as well as answer the public demand for increased leadership in nursing. Special thanks to the staff of Congresswoman Johnson and also Kelly Trautner, Director of the American Federation of Nurses and Healthcare Professionals for their support in making this event a huge success. March 2015: By the end of March organizational support for the National Nurse Act of 2015 had swelled and currently stands at over 110 organizations, quite a feat for an all-volunteer Board and Advocacy Team! Endorsements have poured in from prominent nursing organizations including the American Nurses Association and 11 of their state affiliates- CA, CO, IN, MT, NC, NJ, NV, OH, OR, WA, and WV, the National Black Nurses Association, and the Case Management Society of America. Additionally, over 40 organizational letters of support addressed to Congress have been received. April 2015: Advocates of the National Nurse Act of 2015 took initiative and wrote articles and letters to convey their support. One contributor, Theresa Brown, nurse and contributor to The New York Times, authored an opinion piece, Why I Support the National Nurse Act of 2015, that was published by the Center for Health Media & Policy at Hunter College. May 2015: Senators Jeff Merkley (OR-D) and Shelley Moore Capito (WV-R) chose National Nurses Day to introduce the National Nurse Act of 2015 (S. 1205). "As the husband of a nurse, I know firsthand the hard work that nurses put into caring for their patients and helping them live healthy lives," said Merkley. "As we celebrate National Nurses Day, it is important to recognize the essential role of nurses in our health care system. It's time we had a National Nurse for Public Health who is empowered to act as a national leader in improving our public health." "Nurses play vital role in the healthcare industry and the overall health and well-being of our communities. The designation of a National Nurse for Public Health will not only create more awareness about the important services nurses provide, it will lead to a healthier society. I am proud to join Senator Merkley to introduce this bipartisan legislation recognizing the compassion, commitment and contributions of our hard-working nurses," said Senator Capito. June-August 2015: The summer months were busy building support for the National Nurse Act. Radio host Thom Hartmann interviewed Congresswoman Eddie Bernice Johnson about the National Nurse Act of 2015 (HR 379) to raise awareness about this important legislation. 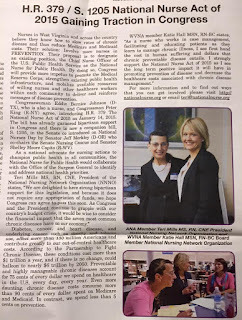 The American Journal of Nursing featured a story, In a U-Turn, the ANA Supports the National Nurse Act, in their August issue. This article contained quotes from ANA President Pam Cipriano highlighting the American Nurses Association's (ANA) support for the National Nurse Act of 2015. Additionally, Chamberlain College of Nursing included an article, Every Voice Counts: Influencing Healthcare Policy in Nursing, in their launch issue of The Chamberlain. This story described how graduate students are taking action and using their voices to promote the National Nurse Act of 2015. September 2015: Members of the National Nursing Network Organization and the Case Management Society of America joined together for a day on Capitol Hill. During this trip supporters managed to visit with over 100 legislators and staff to gain further support for the National Nurse Act. 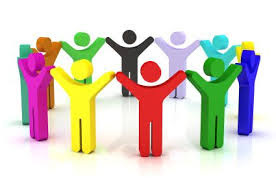 October-December 2015: The NNNO is fortunate to have a committed and enthusiastic all volunteer Board of Directors. There are now 65 activists on the NNNO Advocacy Team that include state representatives, nurse leaders, attorneys, and stakeholders. These individuals continue to use their many talents and time to encourage and gain support from their elected officials for H.R. 379 and S. 1205. The Advocacy Team has also been busy spreading the word about this campaign through publications, presentations and social media. Thanks to their efforts there are now over 4,000 members of the National Nurse Campaign Facebook Group. [https://www.facebook.com/groups/11713834270/] If you belong to Facebook, please join this group. You can also follow the campaign on Twitter, @aNationalNurse, [https://twitter.com/aNationalNurse] for important announcements and updates. The National Nurse newsletter goes out to thousands- please email the NNNO Board if you know of others who are interested in receiving these updates. The NNNO is grateful to the many of you who sent in donations, some in the form of checks and others via recurring monthly donations through PayPal. The popular $20 campaign continued and over 150 informational packets were personally delivered to members of Congress on behalf of those who made these twenty-dollar contributions! The holidays are rapidly approaching. Another great way to support the campaign is by purchasing a mug, magnet, button, bumper sticker, or t-shirt at Café Press. We greatly appreciate this financial support to help maintain the website, mailing list, and brief travels to educate others about the need for a National Nurse for Public Health. Organizational support for the National Nurse Act of 2015 continues to grow and now stands at 112 endorsing bodies. Thank you to the American Nurses Association\California for their endorsement of S. 1205 and H.R. 379, The National Nurse Act of 2015. ANA\C represents 4,500 nurses in California and the National Nursing Network Organization is proud to have their full support for this legislation. On behalf of the 1.6 million members of the American Federation of State, County, and Municipal Employees AFL-CIO (AFSCME), including more than 60,000 nurses, I am writing in support of the National Nurse Act of 2015 (S. 1205). Your bill would enhance the critical role nursing occupies in our country’s health care infrastructure by establishing a National Nurse for Public Health. Preventing illness and promoting health across our nation is urgently needed as more than half of Americans are living with one or more serious, chronic diseases ranging from type 2 diabetes to cancer. If unchecked, the current trend in chronic conditions will put today’s children on a course to be the first generation in our country’s history to live shorter, less healthy lives than their parents. While many resources and coordinated initiatives at the federal and local level are needed to address this crisis, a National Nurse for Public Health will strengthen capacity at the federal level. We thank you for introducing this legislation and for your attention to public health and the role of vital public health nurses. Thank you to the West Virginia Nurse’s Association Organization or publication for including a story, "H.R. 379 / S. 1205 National Nurse Act of 2015 Gaining Traction in Congress", in their Fall Quarterly newsletter. Involving more nurses is key to reducing the high cost of care related to the chronic conditions that are largely preventable. The recent datagraphic in Focus on Obesity, featured in the November 2015 issue of Health Affairs, underscores the current obesity epidemic, a primary contributing risk factor of these conditions. Over one-third of adults and one-sixth of youth in the United States suffer from obesity. The National Nurse Act of 2015 offers a new initiative, raising the visibility of the Chief Nurse Officer who works alongside the Surgeon General. Vice Admiral Vivek Murthy has put out a call to action to promote walking and walkable communities via a “Step It Up Campaign”. The success of this campaign is dependent on participation, and having a National Nurse for Public Health would further inspire the nation’s 3.1 million nurses to become involved.